A document detailing the opening ceremonies of the Oakville Centennial Building. Includes plans for rooms and setup, a program outline, and an action sheet. Where possible all displays should be placed against walls in order that guests can be accommodated in the Gallery. Small statuary should be placed in corners where no accidents can occur. Display boards for paintings should be removed. Immediately following ceremonies, the standby crew should be ready to replace statuary and di splay boards for paintings, as well as to remove platforms, wires, etc. P6rtable fixtures, or fixtures that might be moved, in the main library should be (where possible) moved against walls. All gates within the building should be set in the open position so as to allow free and easy access from room to room. The Gallery is the only large area that can comfortably accommodate in one area the anticipated number of guests. A platform for special guests will be placed again the east wall centre. An area of approximately 6 to 8 feet surrounding the platform will be roped off in order that additional special guests may be accommodated conveniently. It is quite possible that chairs will be placed in this area for these other special guests. The p/A system will be installed at the platform, along with a lectern. The P/A system will be piped to speakers in the main library area. PROGRAM OUTLINE - To begin at 2:00 p.m.
short resume of what will happen during today's ceremony. M. C. announces the beginning of the Official Program, invites group to join in singing of “O Canada". Recorded band music of "O Canada". M. C. introduces platform guests - with full titles, initials, etc. M.C. introduces Ministerial Association representative who is invited to offer prayer of dedication. M.C. introduces Chairman of Project Committee who tells audience in less than 3 minutes of events regarding project leading up to today. The Chairman then introduces the contractor and the architect of the project to the audience. The contractor comes to the microphone and makes presentation of symbolic key to building to the architect. Contractor has brief opportunity to express his pleasure at building the building for the Town of Oakville, etc. and has 1 1/2 to 2 minutes to point out special features of the building and express his thanks, etc. Architect then turns to the Chairman of the Project Committee and hands him the key. Chairman of Project Committee calls on Mayor Anderson to accept key of the building for and on behalf of the citizens of Oakville. M.C. introduces Member of Parliament and M.P.P. - both given very brief opportunity to say a few words.
? M.C. asks the Mayor to introduce special guest. Special Guest - limited to 4 - 5 minutes, but must end his speech by declaring the building officially open. Mayor (now acting as M.C.) introduces Chairman of the Library Board. Library Board Chairman - no more than 4 minutes to point out highlights of main library.
? Mayor - M.C. ? introduces . .
to speak for and on behalf of all donors to the Project. This guest will mention all donors regardless of gift size, and to point out any special guests in the audience who are there to represent the donors (e.g. Danish Consul General for and on behalf of the Danish Canadian Club). Mayor returns to the microphone and makes his final closing remarks, thanking all groups, etc., who have made this project possible. M.C. returns to the microphone and invites all present to take part in a tour of the building, makes any announcements, and officially adjourns the meeting. P/A system - speakers and mikes – contact H. Dyson re this, plus music, records “O Canada", etc. R. J. Cooksley - action. 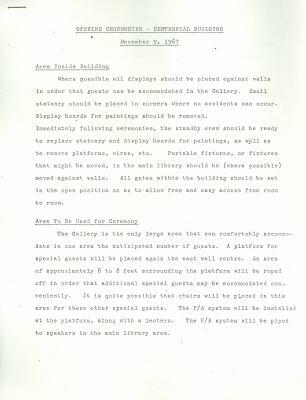 Platforms - from Library or elsewhere if necessary. They should be large enough and strong enough to hold at least 12 people. Need area of at least 8' x 12' minimum. Ropes and standards - for designating areas for guests, others, security, etc. Lectern - for use by speakers. Cloakroom facilities - this should be given very serious consideration. Possibility of using downstairs library area. If so, police officer to be on duty for security purposes.